Tomorrow, December 20, Nintendo is finally launching its TVii service for the Wii U. The television watching service is one of the more highly anticipated aspects of the new Nintendo system. The new TVii integrates titles from streaming services such as Netflix, Hulu Plus, Amazon.com, TiVo and Google, along with live TV. However, some of these services won’t be available through the console until early 2013. TVii itself will be free, there will be a cost for subscription services like Netflix, Hulu Plus, Amazon Prime and TiVo. TVii is designed to make the most most of television viewing, according to Nintendo. It will provide users with more choices to get the programs they are looking for. Once the service is fully functional, if a specific show is not available at a certain time, TVii will provide the option to watch past episodes on Netflix, or buy the newer episodes on Amazon.com. 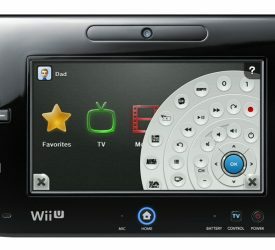 The Wii U’s display pad functions as a remote for the service. It also allows users instant access to other web sites such as IMDB, and will allow users to tweet or update their Facebook status right from the pad itself. Nintendo is confident that the roll out of TVii will boost sales of their already popular Wii U. With precious few shopping days left before Christmas, and reviews on the service popping up by this weekend, we may just see a spike in sales just before the holiday shopping season wraps up. What do you expect from the new TVii app for Wii U? Leave your comments below! Mel is a RN, a writer, and a mom. She's looking to branch out to different areas, and has loved writing as long as she can remember. Mel has plans to return to school next year to further her education, either in journalism or freelance writing. Right now she has her own personal blog at www.paranormalwanderer.blogspot.ca.